We have all been there where are so overwhelmed it paralyzes us. You pull out your to do list and it is long. Or you walk in your house after work and see an unbelievable mess in every room. Or maybe you have a project, a school assignment, something you need to work on with work, and it seems so overwhelming that it stresses you out and you just can’t seem to take the first step in getting started. And so what do you end up doing? Nothing. I have had many days where I know I need to clean and organize, go grocery shopping, work on my blog, etc., that it seems so overwhelming that I don’t even know where to begin. And so what do I end up doing? Hardly anything at all! It’s almost like it paralyzes me and instead of being in anyway productive, I do nothing. And I know I’m not the only one that this happens to. I’m not sure why we do this. And I’m sure some of us are better than others at getting things done when we are feeling rather overwhelmed. But I think it’s safe to say that enough of us experience this that it is important we talk about it and take steps to overcome it. When you have a day like this – when you are so overwhelmed you don’t even know where to begin – follow these tips to help! This post was republished March 2, 2019. What I have noticed is that I do a lot better when I take everything I need to do and break it down into simple steps. Breaking it down like this makes it a lot more manageable. I think whenever something becomes more manageable, it most certainly becomes a lot less overwhelming. With that being said, do you keep a to do list? If not, I strongly suggest you start keeping one and prioritize it. It can greatly help you when you need to break down what you need to do so that you are not so stressed. My sister-in-law, who is pregnant right now, said the only way she has been able to get anything done lately and keep track of it is by having a to do list. And if you have ever been pregnant then you know how difficult it can be to stay on task with anything! Once everything you need to do is broken down, it is much easier to focus on only one thing at a time, which makes what needs to get done even more manageable. One reason why we become so overwhelmed by having a lot to do is because we have no idea how we are ever going to get it all done. Sometimes it just seems like too much that it’s impossible to ever do. Focusing on only one thing at a time can make it seem a lot more likely you can make progress. If you have a lot to do ahead of you, just keep telling yourself that all you can do is one thing at a time. That should hopefully take your mind off of anything else you may have on your list and make you feel that only needing to get one thing done isn’t so bad. Once you finish that one thing, then you can move on to the next and feel your stress level go down. And if it you are having a really tough day, then maybe only plan to get one thing done that day. Breaking it down also means you can choose which of the broken down tasks you want to do that day. You can do many of them or just a few. Either way you choose, give yourself an end. I might choose only 3 things to focus on in a particular day. I might clean the kitchen, research my next blog post, and create a weekly meal plan. Depending on the length of those tasks, I may add a few more things or just decide that as soon as I finish the last one, that’s it, I’m done for the day. Depending on how long each task will take, you may have a list of 10 things you want to get done that day or only 2. If you’re not sure how to choose what it is you should work on, check out this post on prioritizing. The amount you set the timer for varies depending on what you’re doing. But it is something you should experiment with and see what works best for you. Depending on whether you’re cleaning, working, or checking email, you may want to set it at 15, 30, 45, or 60 minute increments. Or make it a little more fun by setting it for odd times like 22 or 37 minutes (speaking as a former teacher, kids love those odd times!). Everyone and every task is different so figure out what works best for you. You challenge yourself to see how much you can get done in an allotted amount of time. It can be fun to “race” the clock with someone else resulting in you getting even more done than you would have otherwise. It gives you an opportunity to take breaks, something that is important in order to be productive. Sometimes I may even decide to only put a few minutes into something every day. It really just depends on what it is. Right now our office/guest room is a MESS! It has kind of become our storage area for anything we are not sure where to put right now. My goal is to bring some sort of sense and organization to it. And let me tell you, when I think about what I need to do to get that done, overwhelming doesn’t even describe how I feel! And so I struggled to even begin working on it. But I have recently changed my process, which is making it a lot more manageable. Instead of carving out a few hours one day to spend getting it into shape, I told myself that all I need to do is spend 10 minutes once a day working on it. (It is amazing how much you can accomplish in only 10 minutes!) I am currently in the middle of this and before I know it, it will be done! Taking these small steps to get it done is the only way I was ever able to get started on it. When it comes down to it, sometimes you just have to start somewhere. It could just be that taking that first step was all you needed to get going. Have you ever started something that you thought was going to be so tough but once you began, you realized it really wasn’t all that bad? Take that first step and see if that is the case! Sometimes, we just need to admit that we can’t do it all ourselves. And on those days when we are having a really difficult time, it just might be best to ask someone close to you for help. Feeling overwhelmed and stressed doesn’t have to stop you from being productive. Instead, there are real steps we can take to make what we need to do more manageable, which will help us get more done. 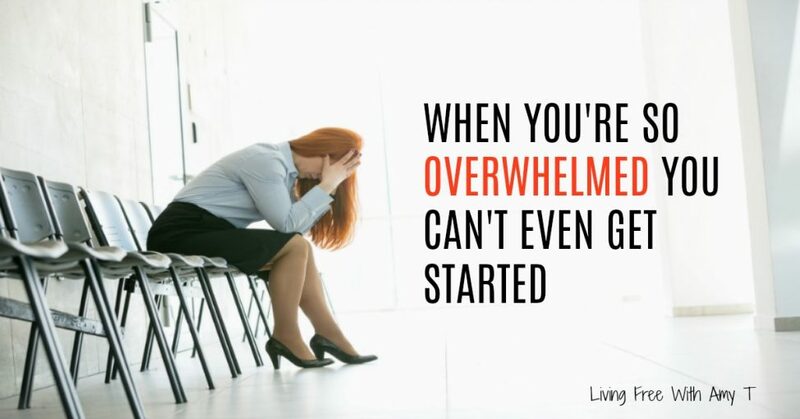 Click here to learn about One Of The Biggest Reasons You’re Feeling Overwhelmed And What To Do About It. Thank you for the tips. I’m currently overhauling my craft room and I’m right in the middle. Thanks for reminding me that this will get done. It’s sometimes easy to look at all the mess and imagine it will be how I want and be tempted to just hurry and get it done. But I’m happy that I can look at this as a process and know I can take my time to do it right. Thanks for these tips I will defo try be more detailed in what I need to do. I’m suffering from anxiety and finding everything too much. Spring is in the air, whole house needs a deep clean and declutter. Also heading on holidays in a week. Need to pack and get organised. Great tips. When thinking about what we need to do it is not uncommon to fall prey to overwhelm. Hi Amy. I used to panic first thing in the morning as I walk into my workshop. I’d waste so much time. Now I drop everything at the door, set my timer for twenty minutes and start a task. When the ringer goes I’m in the middle of something, so take a quick break to put the kettle on and clear my stuff by the door and I’m right back into it. It really works wonders for me. Another version of your hot tip. It might help someone else. That’s great! Thank you so much for sharing! I’ve been trying to use a list lately, and one extra thing I do, is add a time factor, so I’m not going crazy and making a list that would actually take 2 people a week! I list the things I really want to get done, then I make a second list, scheduling when I think I’ll get to it today. When the time’s up, I move on. Unfinished tasks appear again tomorrow. The other thing, I schedule what’s tiring, or things I have trouble with, early in the day. I schedule breaks and lunch too! Best thing? Crossing things OFF as you do it! When I got divorced, a million years ago, I was left with so much stuff in my basement. I knew I’d be in that house for a few years but that basement would have to be clean when I sold. My trash was collected once a week. I decided to put out one item every week until the basement was clean, this took under one minute every Wednesday. This worked wonderfully. If I was having a good day I’d put out more than one item. There was no pressure. The basement seemed to empty itself and became a useable space long before I finally sold. What a great way to empty your basement without any stress or overwhelm. Thanks for sharing!